What would ‘normal’ TIPS yields look like? You might ask: ‘How are you going to define ‘normal’? Good point. In the financial world, the going price for anything might be called the ‘normal’ price, set by free markets. But in the case of Treasury Inflation-Protected Securities, normal is very hard to define. So, for today only, I am going to define ‘normal’ to mean ‘acceptable.’ In other words, attractive to buyers, a sensible investment, and in line with historical trends. Today, with a 10-year TIPS yielding about 0.52% above inflation, I don’t think we are there yet. I have tried in the past to project a ‘sensible’ yield for a 10-year TIPS, and I came up with a yield of about 1.76%, plus inflation. We won’t be seeing that anytime soon, but read my analysis to see why TIPS yields will eventually return to that level, and probably higher. 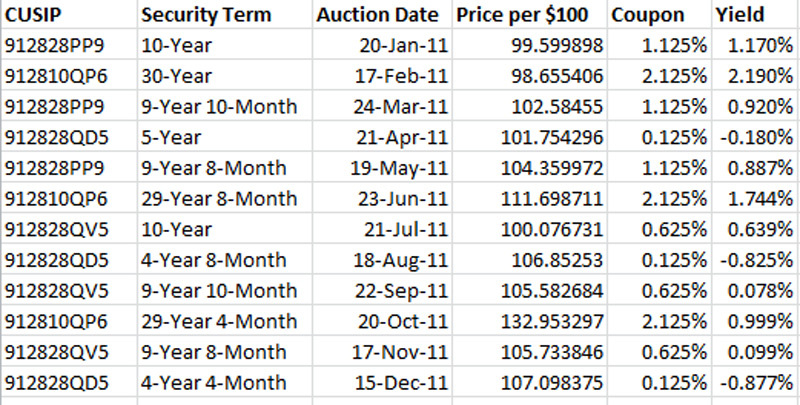 So for today, I decided to declare the first auctions of 2011 – for 5-, 10-, and 30-year TIPS, to be about as ‘normal’ as we can expect to see in the next two years. Why early 2011? The TIPS and Treasury markets dramatically changed in mid-2011, a fact I detailed in this post: The TIPS earthquake: When did it happen, and why? It’s strange, but the factor that triggered this upheaval was the crushing failure of Congress to address runaway government spending and spiraling deficits. Eventually, Standard & Poors downgraded U.S. debt – and the result was that U.S. debt skyrocketed in value. As weird as that seems, that’s the way it happened. I started this blog in April 2011 and at the time TIPS were as boring and conservative an investment as exists on Earth. Within a few weeks, I read a commentary that said: “The only reason to buy TIPS is for the capital gain.” I was horrified! No, TIPS are conservative! Not for trading! But the commentator was totally correct. TIPS were about to launch into massively lower yields and higher prices. Jan. 20, 2011. A new 10-year TIPS, CUSIP 912828PP9, auctioned with a yield to maturity of 1.17% and a coupon rate of 1.125%. Since that date, no 9-to 10-year TIPS auction has generated a yield above 1%. The highest yield since then was 0.92% for the reopening of this same TIPS on March 24, 2011. Feb. 17, 2011. A new 30-year TIPS, CUSIP 912810QP6, auctioned with a yield to maturity of 2.19% and a coupon rate of 2.125%. The highest yield since that date for any 29- to 30-year TIPS was 1.42% in June 2013 for a reopening of CUSIP 912810RA8. April 21, 2011. A new 5-year TIPS, CUSIP 912828QD5, auctioned with a yield to maturity of -0.18% and a coupon rate of 0.125%. At the time, this auction made headlines: BUYERS ACCEPT NEGATIVE INTEREST ON TIPS! Several financial columnists derided buyers as fools. I was a buyer, and I didn’t feel foolish. Since that date, the best yield on any 4- to 5-year TIPS auction was -0.13% for a reopening of CUSIP 912828UX6 on Aug. 22, 2013, another auction where I was a buyer. 3 Responses to What would ‘normal’ TIPS yields look like? Between 1900 and 1955, regular old 10 year treasuries traded pretty much between 2% and 4%. After 1955 the rates increased dramatically until peaking at 15% in 1981. From the start of the increases in 1955, it took another 55 years for it to get back down to 2%. In 2011, it went below 2% for the first time since 1941. In 2012 and 2013, it spent close to a year below 2%. That’s regular 10 Treasuries! Was 1900-1955 the norm? Or, 1956 to 2010? Either period you choose indicates that the last three years are an anomaly and that rates have to go up from here. Yet, 2014 has seen 10 year Treasuries interest rates decline to levels achieved in July of 2013. Assuming that rates are on the rise, buying 10 year TIPS with a yield to maturity under 1% leaves you open to interest rate risk. From May to September last year, regular 10 year Treasuries went from 1.6% to nearly 3%. That’s well over 1% in around 4 months. This just shows how undervalued the Treasuries were at that time. Of course, this was all due to the QE and the market reaction to merely suggesting tapering QE. Right now, the question is how undervalued are 10 year Treasuries at the current rate of around 2.7%. The period between 1900-1955 had an average rate of around 3%. The period between 1956-2010 the average was around 7%. Based upon 1900-1955, 10 year Treasuries at 2.7% have a rate spread of less than 1% from the 3% average and just under a 2% rate spread from the high of 5%. Based upon 1956-2010, 10 year Treasuries have a rate spread of rather significant 4% against the average and a rate spread of a whopping 12% against the high of 15%. With the Fed rate effectively at zero and the inflation rate declining over the past 2 years, I’d guess that the 1900-1955 interest rate range is more representative of the current financial environment that we find ourselves in. Any TIPS with a positive YTM don’t look too bad if the interest rate risk is only 1% to 2% over the next 10 years. Of course, the above analysis completely ignores the black swan events that make TIPS a buffer against unforeseen inflation. Last year, who would have predicted the Russian invasion of Crimea and the effects that a possible trade embargo on Russia will have on gas and oil prices? Even with the paltry yields that TIPS have at the current time, they do provide some protection against interest rate risk. One bit of research that I need to do is determine the historical proportion between the inflation rate and coupon rate components of TIPS versus actual interest rates. Since its a nice day, I’d better get out in the yard and get a little exercise. JImbo, great analysis. I look at how the 10-year Treasury compares to the inflation rate. Right now the inflation rate is running 1.6% and the 10-year Treasury is yielding 2.7%, so that is 1.1% above inflation and somewhat reasonable. A 10-year TIPS is yielding 0.52% above inflation, but you are protected against unexpected inflation in the future. I would expect investors to demand that 10-year Treasuries yield at least 2% above inflation, the traditional return of high-safety bonds. But right now they are accepting far less. But if world stays peaceful and the U.S. economy continues to recover, yields are going to rise. Let financial columnists make us feel foolish? Well then we WOULD be foolish! These people are just shills to put it as nicely as possible. Perhaps they have some nice high-yielding emerging markets bond fund for us or a junk ( oops, they’re high yield) bond fund with a 1% expense ratio for the yield hungry. When I look at the auction results the non-competitive bids are usually pretty sparse (I assume these are retail investors) which would lead me to think most people don’t get it. They should be here and not at The Motley Fool.